To Cite: Adinehvand K, Sahebnasagh A, Hashemi-Tilehnoee M. Radon Concentration in the Drinking Water of Aliabad Katoul, Iran, Iran Red Crescent Med J. 2016 ; 18(7):e27300. doi: 10.5812/ircmj.27300. Background: According to the world health organization, radon is a leading cause of cancer in various internal organs and should be regarded with concern. Objectives: The aim of this study is to evaluate the concentration of soluble radon in the drinking water of the city of Aliabad Katoul, Iran. Materials and Methods: The radon concentration was measured by using a radon meter, SARADTM model RTM 1688-2, according to accepted standards of evaluation. 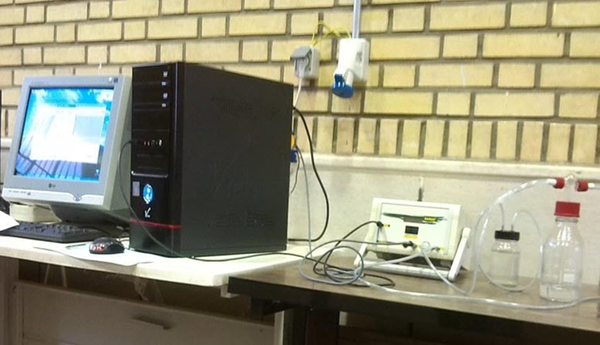 Results: The mean radon concentration in the drinking water of Aliabad Katoul is 2.90 ± 0.57 Bq/L. Conclusions: The radon concentration in Aliabad Katoul is below the limit for hazardous levels, but some precautions will make conditions even safer for the local populace. Radon causes about half of the annual radiation exposure to humans coming from natural sources (1). Noble radon gas, whose mole fraction is fifteen times greater than that of helium or neon, is highly soluble in water. People who ingest or inhale radon are susceptible to accumulating high concentrations of the substance in their systems, leading to greater health risks. As exposure to radon and its progenies increases, so does the risk of contracting cancer. According to various studies, radon inhalation is a leading cause of lung cancer in the country of Iran (2, 3). Other organs are also exposed to the risk of cancer when radon is ingested from water. However, the risk of cancer from inhaling radon gas released from solution in water is estimated to be about nine times greater than that arising from ingesting radon dissolved in drinking water (4). In this study, we evaluated the radon concentration in the drinking water supply of the city of Aliabad Katoul, Iran. We measured a total of 16 samples using a radon meter as described below. We evaluated these readings with regard to criteria for acceptable safe radiation doses. 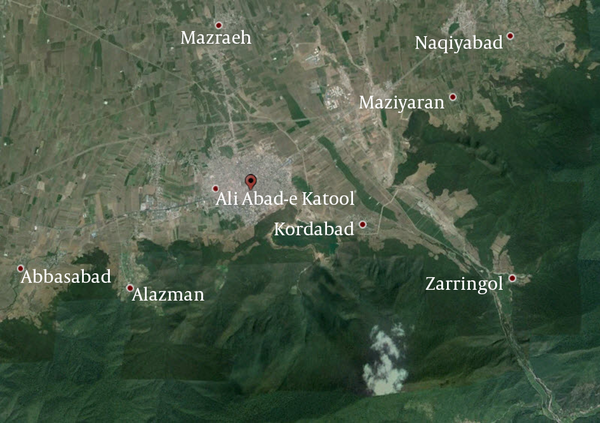 The city of Aliabad Katoul and its related villages are located in a semi-jungle region, as shown in Figure 1. This city relies on several rivers, waterfalls, and wells to supply the drinking water for its populace. By determining the concentration of radioactive radon in the ground water supply intended for human consumption in the city of Aliabad Katoul, this study will attempt to evaluate the quality of the city’s drinking water. We collected a total of 16 water samples from different sources of the drinking water supply according to standards set by the United States environmental protection agency (USEPA) (5). We used a radon meter, model RTM 1688-2 made by SARADTM, which had been calibrated by the manufacturer. Figure 2 shows the setup of the experiment. Where QRTM is recording data, Vtot (2.4 × 10-3 m3) is the volume of the detector, V (Lit) is the volume of the water sample (0.3 Lit) and t is the time. The samples were read after 25 days of radium equilibrium. Table 1 shows the concentrations of radon in selected drinking water samples from the city water supply system of Aliabad Katoul. Radon levels were observed to be lower in the river water and the waterfall than in the wells. This is because the radon gas escapes from naturally flowing water or when the water is exposed to air. The mean radon concentration for the Aliabad Katoul samples is 2.90 ± 0.57 Bq/L. The maximum safe amount that the USEPA has proposed for drinking water is 10 Bq/L (5). Thus the amount of radon in this city is below the maximum limit set forth by the USEPA, and there is no threat from high radon concentrations to the residents of the city and its environs. Moreover, in the regions where only groundwater sources are used, aerating the drinking water before its consumption dramatically reduces its dissolved radon levels. This work has been supported by a research contract with the Islamic Azad University, Aliabad Katoul branch.